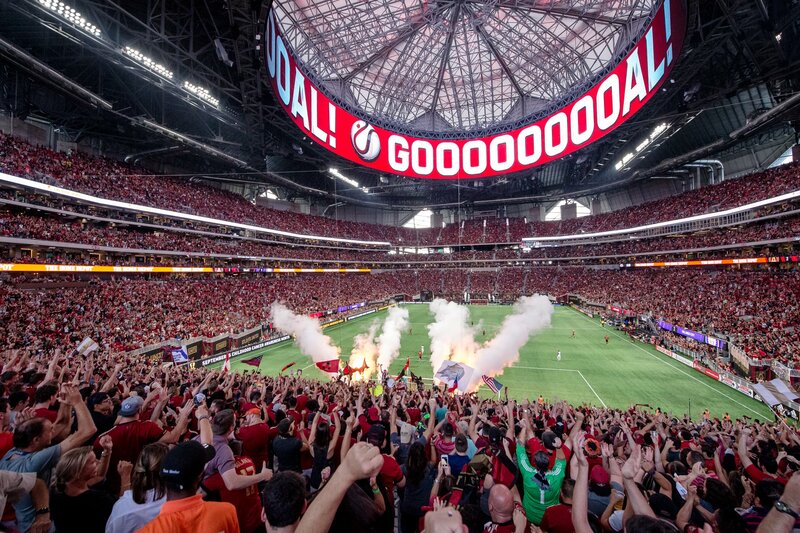 Atlanta United dominates DC in front of a MLS record attendance Reviewed by Founder on March 12, 2018 . Coming off a terrible defensive showing and 4-0 defeat to Houston Dynamo, Atlanta United FC was in full swing after they took a massive 3 points and 3 goals away from DC United. DC United was Atlanta’s kryptonite last season winning 2 out of 3 and drawing once leaving Atlanta 0-2-1 in their fight against DC United. This season Atlanta looks to settle the score with DC and exact sweet revenge. In front of a new MLS record attendance of 72,035, Atlanta United turned DC on their heads after Atlanta’s big three all found the back of the net. Josef Martinez scored in the first half at 23 minutes off a nice pass from Tito Villalba. The match was 1-0 Atlanta at the end of the first half. With plenty of opportunities in the early minutes of the second half, Miguel Almiron finally broke through and scored with a screamer at the top of the box in the 72 minute mark off of a beautiful cut back pass from Julian Gressel. Two minutes later in the 74th minute, Miguel Almiron put a lob in the middle of the box which Tito Villalba would redirect into the back of the net with a beautiful header right past the outstretched hand of DC United keeper Ousted to give Atlanta a 3-0 lead late. DC would get one back in the 85 minute after a deflection off of Michael Parkhurst found Mattocks in the open who drilled it past Atlanta keeper Brad Guzan. The game would end with Atlanta taking home a 3-1 victory over DC. Atlanta will take this momentum into Saturday, March 17 as they take on the Vancouver Whitecaps. Nick serves as Show Promotion Director for The WOLF Internet Radio. He also is a frequent guest of The Sports Pack Mondays at 7p.m.